I’ve actually never made a stuffed squash. Plenty of stuffed peppers, but they were OK and not the BEST, but this, oh this, is moist and satisfying to every last bite. Butternut squash is one of those fantastic veggies that can either go sweet or savory. It’s the little angel or devil of the culinary world. It wears leather one night, and lace the next. You are one feisty little fox, Madame Butternut Squash! Sage is my favorite herb of the season, and with ripe, sweet apples fresh off the tree this time of year, I couldn’t help but imagine cocktail of sweet and savory. Preheat oven to 370°. Chop veggies as noted in ingredients list. Once oven heats, go ahead and half the butternut squashes, scoop out the stringy flesh and seeds with a spoon or ice cream scoop and place them on a cookie sheet on the bottom 1/3 of the oven for 20 minutes. While they’re cooking, work on your filling. Heat olive oil in a medium skillet on medium high heat. Once heated, add onions and sage, sautee until the onions start to get opaque. Add slivered almonds and rice, stir to coat. Add rice, vegetable broth, rosemary, and sea salt. Simmer until rice has absorbed about 3/4 of the water, then add apples and kale. You want to add the apples and kale at this time to keep them from getting crazy soggy and falling apart. 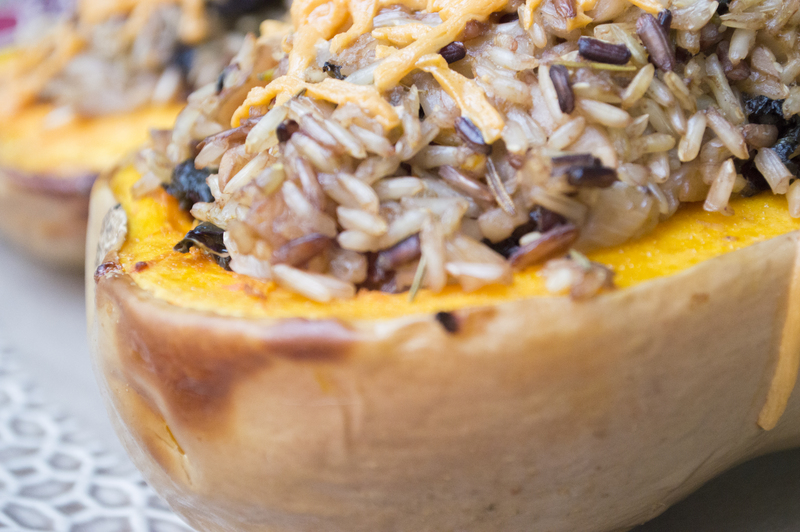 If your oven timer goes off for the squash before the rice is done, go ahead and move the squashes sans filling to the top rack, and turn up the heat to 400°. Roast here for 15 minutes. Fill each with the rice pilaf filling, top with Daiya and roast for another 10-15 on the top rack. Makes 4 really big servings. Oh yum!! Will definitely be making this around the holidays!